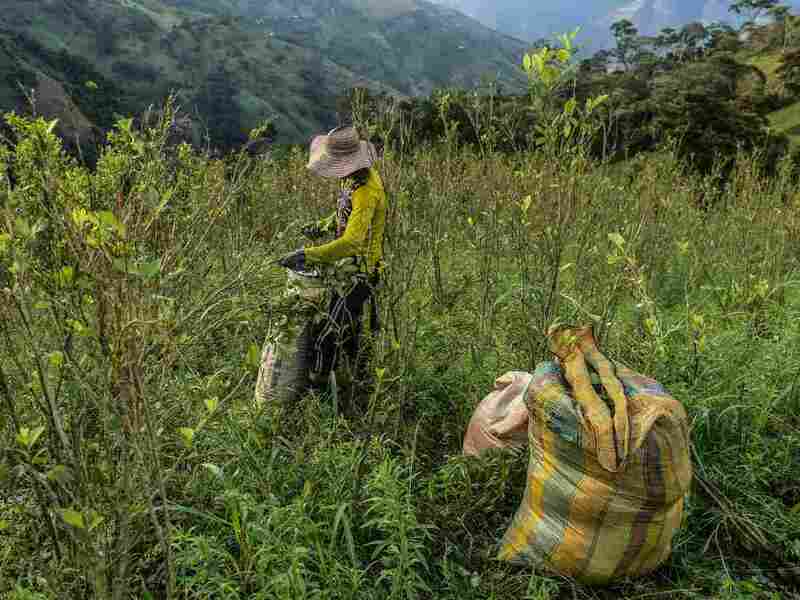 Colombia Is Growing Record Amounts Of Coca, The Key Ingredient In Cocaine The country's rising cocaine production has alarmed Washington, which has spent more than $10 billion over nearly two decades to attack the illegal drug trade in Colombia. A farmer picks coca leaves in a field in Colombia's Antioquia department last November. To explain why he grows coca, the raw material for cocaine, rather than food crops on his 5-acre farm in southern Colombia, Luis Tapia does the math. Every three months, Tapia, 60, harvests the bright green coca leaves with his bare hands, then mixes them with gasoline, sulfuric acid and other chemicals to make coca paste. He then sells the paste to drug traffickers who turn it into powder cocaine. A pound of paste, he says, sells for more than one ton of corn. "That's why everyone grows coca," Tapia says. Last year, Colombian farmers like Tapia produced 422,550 acres of coca, the largest coca crop in Colombia's history, according to a United Nations survey released last month. That's enough to make about 1,500 tons of cocaine, the report said. Rising cocaine production has alarmed Washington, which has spent more than $10 billion over the course of nearly two decades to attack the illegal drug trade in Colombia. Last year President Trump threatened to decertify the South American country's government as a reliable partner in the war against drugs. Trump has since softened his rhetoric and will travel to Colombia in December to meet with Iván Duque, the country's new conservative, pro-American president who was sworn in in August. Colombia has long been the world's No. 1 producer of cocaine and the United States has been its main consumer. Despite some advances over the years in rolling back drug production, the South American country has struggled to maintain any hard-won progress, says Adam Isacson, a Colombia expert at the independent think tank the Washington Office on Latin America. Along with attacking drug laboratories, arresting traffickers and going after cocaine-laden boats and aircraft, Colombian authorities focus on the coca fields, which are the most visible part of the cocaine industry and the easiest to target. To that end police crop-dusters in the late 1990s began spraying weed killer on coca fields, which, by 2013, helped to reduce the size to less than one-third of the current acreage, according to the U.N. But the planes often hit pineapples, beans and other food crops by mistake, enraging peasant farmers and boosting local support for leftist guerrillas who were deeply involved in the cocaine trade. Finally, in 2015, Colombia halted aerial fumigation over concerns that the herbicide, glyphosate, might cause cancer. More recently, the Colombian government has been encouraging growers to voluntarily uproot their coca in exchange for cash payments and help in transitioning to legal crops. More than 124,000 coca farmers signed up. But so far the effort has backfired, says Bo Mathiasen, who heads the U.N. Office on Drugs and Crime in Colombia. "The word out in these coca-growing areas was if you grow coca you'll get benefits but if you don't have any coca you'll probably not get anything," Mathiasen says. "So there was clearly a perverse incentive that made farmers — if they didn't have coca — they'd grow coca. And if they had coca, some of them would actually grow more." Now, Colombian officials fear that the boom in the cocaine trade could threaten the country's fragile peace process. 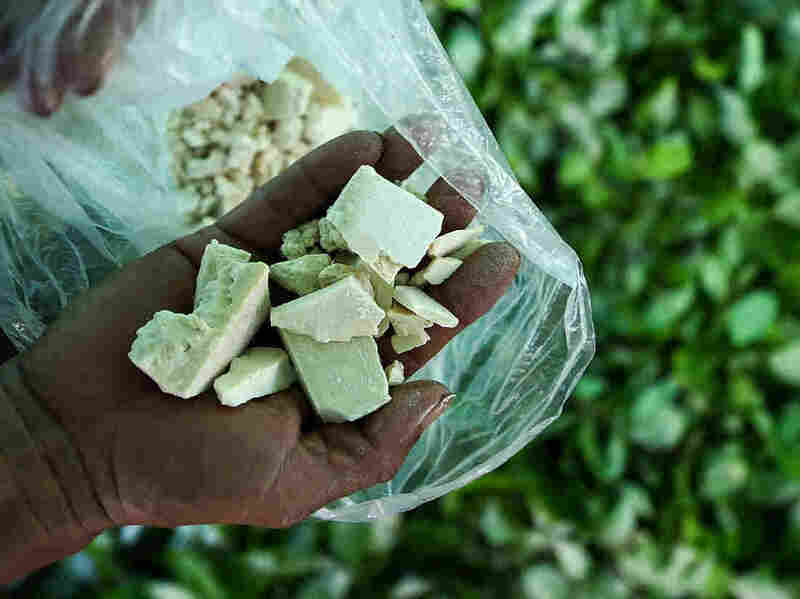 A farmer shows cocaine base paste, made from coca leaves in Colombia's Guaviare department in 2017. Under a 2016 treaty, Marxist guerrillas — who along with drug cartels were deeply involved in the cocaine trade — disarmed after more than 50 years of fighting. But a new generation of violent drug-trafficking gangs has moved into former rebel territory. These groups are pressuring farmers to grow more coca and are killing local leaders involved in promoting alternative crops, Mathiasen said. In a September speech before the U.N. General Assembly, President Duque declared: "For peace to prosper in Colombia, we must defeat drug trafficking." Duque is considering bringing back aerial fumigation. His government is also experimenting with herbicide-laden drones that could be more accurate than crop dusters. The drones fly about 3 feet "over the coca crops and spray them directly and have GPS records of everywhere they go. They can run for about 10 or 15 minutes before they need a recharge," Isacson says. "But if you have thousands of those around the country, then the effect might be similar to massive spraying from aircraft." Meanwhile, the Duque administration has sent teams of civilian eradicators to manually uproot coca fields. But the work is slow, expensive and dangerous. During a recent operation observed by NPR near the Ecuadorean border, an eradication team had to be transported by police helicopters because the coca fields are located deep in the jungle. Once on the ground, the workers use shovels to slice through the roots of the plants, then yank each coca bush out of the ground. Police with automatic rifles and grenades stand watch. That's because drug gangs sometimes fire on the teams or rig the fields with explosives. Since 2006, these attacks have killed more than 60 eradicators and wounded nearly 400 nationally, according to Colombian news reports. Jesús Bastidas, the leader of this eradication team, nearly became part of the death toll. He said that while working in a coca field last month, he stepped on a land mine that failed to detonate. His team's campsite has also been hit by gunfire and homemade rockets. That's why, he says, "I always have my men dig trenches." Besides forced eradication, the government should also focus on providing coca-growing communities with roads, schools and economic development, says Andrés Bermúdez, a Colombian journalist who writes extensively about drug issues. Unless impoverished farmers find a legal way to make a living, he says, they will stick with coca. "You can spray how many crops you want, but these people, if they do not have livelihoods, if they do not have alternatives, they will simply go back to growing it," Bermúdez says. In fact, the Colombian government is spending huge sums on crop-substitution programs, according to Mathiasen of the U.N. But local farmers complain that the programs are marred by red tape, corruption, and an unfamiliarity with what crops prosper in deep rural areas of Colombia. Back at his tiny farm house, Tapia, the coca farmer, and his wife have just received a box of garden supplies from the government to help them grow food in exchange for cutting down their coca. But they point out that many of the seeds are for lettuce and other vegetables that don't do well in the thin tropical soil. Coca seems more reliable to Tapia, who has been growing it for 40 years. He says the crop helps him support his four children, an infant granddaughter and Tapia's 85-year-old father. So at least for now, as an insurance policy, he plans to stick with it.